Number 6, green Vegetables and Non-Starchy Vegetables: eat as much as you want. These include alfalfa sprouts, arugula, avocado, artichoke, asparagus, bok choy, bamboo shoots, broccoli, Brussels sprouts, butternut squash, cauliflower, cabbage , chard, chives, cucumber, dandelion greens, egg plant, endive, escarole, fennel root, and greens of all types including: beets, collards, mustard, greens and turnip greens. Now, one thing about cauliflower: cauliflower is a great substitute for rice or potatoes in a meal or a recipe. Other vegetables include green beans and string beans, kale, kohlrabi, jicama, leafy greens, leeks, lettuce of all types including: butter, Boston, romaine, ice burg, mushrooms, okra, onions, parsley, peppers, pumpkin, radicchio, rhubarb, shallots, sprouts, spinach, scallions, snow peas, string beans, sugar snap peas, salad greens, summer squash, tomatoes, turnips (and turnips are a great substitute for potatoes in a recipe), watercress, wax beans, and zucchini. The reason I wrote this really long list of vegetables is that there are so many vegetables in the produce department. And if you say, “Oh, I don’t like vegetables,” then you probably haven’t tried them all. So go out and really find some vegetables that you love. Some other notes on vegetables: any vegetable leaf is acceptable. Also, avoid potatoes. Avoid potatoes of any type. Also avoid corn, because potatoes and corn are starchy, carbohydrate vegetables. Finally, carrots and other vegetables not listed – they may be starchy too – so be sure to check the carbs on anything that’s not listed on this list. Next, number 7, low carb protein smoothies. You can choose low carb protein smoothies of any flavor you like – chocolate, vanilla, strawberry. You can even use your own berries to flavor them but you have to count the carbs in berries. 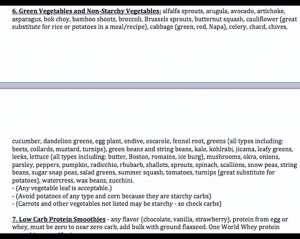 The protein comes from either egg or whey protein and it must be zero-carb or close to zero-carb protein smoothie mix. You can add bulk to your smoothie by using ground flaxseed. The kind of smoothie I use is One World Whey, and One World Whey tastes like ice cream. It’s a little bit more expensive. But there’s a whole smoothie section in your grocery store so go down there and just buy a canister and try it, and keep trying them until you find one that you really like. When you make your protein smoothies: number one, you add ice. Number two, you need to add a liquid. And the liquid that you can use can be heavy cream – heavy cream really bulks it out, it adds some good, healthy fat that you need, and it has less carbs than, say, skim milk. Number 8, low carb and zero-carb snacks. These are the kind of snacks that I eat all the time. These include nuts. Nuts can be salted, raw, or cocoa- covered with sucralose. At the local Big Box store here, they sell coco-covered almonds which have sucralose on them and they’re a great substitute for chocolate. That way you get lots of protein, lots of healthy fats, you get your chocolate craving taken care of. They’re a little bit sweet because of the sucralose, but they’re low carb. Other snacks you can have include pork rinds, sugar free jello, cheeses, meats, eggs (you can keep boiled eggs around), 100% flax seed crackers, protein smoothies (as mentioned in the section above), beef jerky, pepperoni, ham or turkey rolls. Next, we’re gonna move on to the next section. The next section is Do Eat As much as You Want, but for these foods you need to start counting the carbs. Everything above that we just discussed, you can have as much as you want without counting the carbs; everything below, now you have to start counting the carbs. So these foods, where you have to count the carbs, are the ones that should be your “side dishes.” They should make up less than 1/3 or 1/4 of your plate; they’re the small side dishes. And if you wanna now how many carbs are in your food, just Google it. Google “Net Carbs in X.” Or if it’s something that comes in a package you can just read the label. 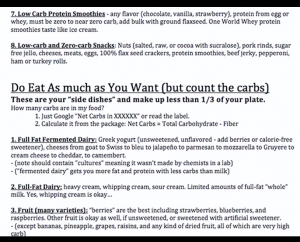 You’ll need to calculate the net carbs from the package: The net carbs equal the total carbohydrate minus the fiber. We’ll cover that in the section coming up. 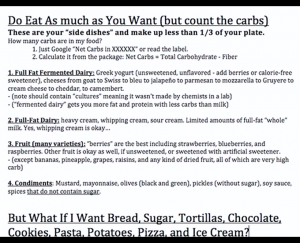 So things that you can eat as much as you want, but you need to count the carbs, are number one, full fat fermented dairy; number two, full fat dairy; number three, fruit of many varieties; four, condiments. So first, number one: full fat fermented dairy. This includes Greek yogurt. Now, for any kind of yogurt you’re gonna eat, it needs to be unsweetened and unflavored. If you want sweetener, you have to add calorie-free sweetener yourself. And if you want a flavor, you can add berries yourself. If you want the food manufacturer to do it for you, they’re gonna add a lot of extra carbs to your yogurt. Next, other full fat fermented dairy includes cheeses from goat to Swiss to bleu to jalapeño to parmesan to mozzarella to Gruyere to cream cheese to cheddar, to camembert. Just pick the kind of cheese that you like, that you love. There’s a whole section of cheeses. Now, note, the cheeses and the yogurt should contain “cultures” in the ingredients list. That means it was made by actually culturing the milk product and not made by some chemists in a lab. And number two, fermented dairy will get you more fat and more protein in it with less carbs than milk – the fermentation process takes out some of the carbohydrates. The other type of food you can eat but you have to count the carbs are full fat dairy. This includes heavy cream, whipping cream, sour cream and other creams. Limited amounts of full-fat “whole” milk can be taken as well. And yes, whipping cream is okay, you can use it for your smoothies, you can whip it and put it on top of berries for a dessert, it’s wonderful. Number three, fruit. You can have many varieties of fruit. The “berries” are the best including strawberries, blueberries, raspberries, and even blackberries. Other fruit is okay as well, if it’s unsweetened, or if you sweeten it yourself with an artificial sweetener. The exceptions to the fruits are the fruits that you should really watch out for because they’re super high carb, are bananas, pineapple, grapes, raisins, and any kind of dried fruit. Finally, number four, condiments. You can use as much mustard, mayonnaise, and olives as you want. Olives can be black or green; have all the pickles you want as long as they’re pickled without sugar. You can use soy sauce and spices and other condiments, but be sure that the condiments do not contain sugar, or count the carbs for the amount of the condiment that you have.